Volunteering with AERU and getting the chance to live and work alongside some of the most beautiful creatures on this planet (even if we do say ourselves) affects people in many different ways – some in ways they never thought possible until they experience it for themselves. It is especially rewarding for is to witness the bonds that can be formed between man and animal. 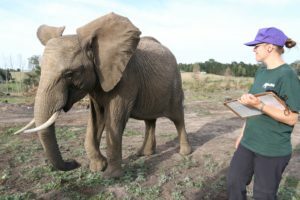 We love that after leaving, most people want to stay connected with the lives of the elephants and the work that AERU does in some way. Most will read this newsletter – hello! 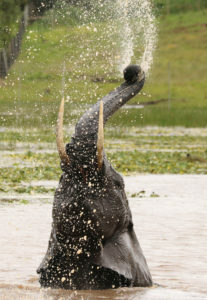 Some will sponsor an elephant, others will return to volunteer (some many times over), and a few will show their on-going support and commitment to the elephants and AERU in other ways – be it raising donations for our research and lab, donating equipment or pledging, even if they can’t be there in person, to be there in any way possible for their beloved elephant(s) at any given opportunity, such as birthdays. Jacob Templer, a volunteer from last year falls into this last category. During his four week stay here in 2018, Jacob fell in absolute love with Shungu and so it was only natural he wanted to celebrate his special boy’s recent birthday. 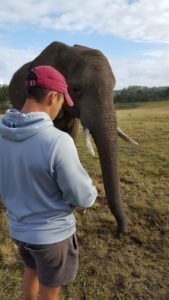 Jacob sent us a very generous donation with the instruction to spoil Shungu with some kind of edible treat (with some persuasion we convinced him to allow the other ellies to have some too!). As Shungu had already had his birthday “cake” we decided to do something a little different and create a floor enrichment for him, Mashudu and the girls in their night camp. (Sally, Nandi, Thandi and Thato also received lots of hidden fruits and veg in their night camp, giving them a very entertaining and edible game of hide-and-seek!). 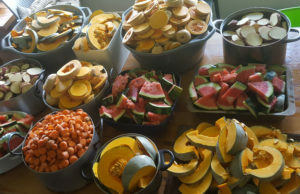 The volunteers had lots of fun prepping the mountains of fruits and veggies and then laying them out with a message we can all sympathise with “#Elephantlove” – we felt this was a fitting tribute. AERU could not complete its ongoing work without the dedication of the volunteers we have through its doors. We are grateful to each and every one of our Jacob and Shungu honorary AERU “herd” members. For time spent here having a heart-to-heart and for the love, support and dedication to our elephants whilst here and beyond – THANK YOU! Your continued support through everything means the world! 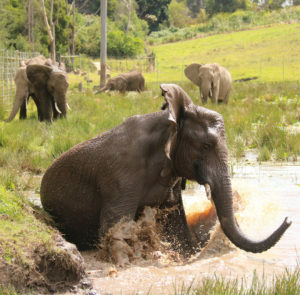 As the matriarch of the family, Sally acts as the leader of our elephant herd. It is a unique and beautiful thing to witness as most of our herd are not related, which differs from the dynamics you would usually see in the wild. Despite the difficulties they have overcome in their early lives (before they joined us), our elephants have bonded as a tight-knit family, with Sally lovingly watching over her adopted herd. However, in spite of Sally’s caring nature there is one thing she struggles to come to terms with – sharing food! This became more apparent at fruit-feeding time, especially with the arrival of the three new girls – things were becoming a bit more squashed at the barriers. Sally, being the head of the family, takes centre-stage and stands in the middle of the barrier – this means that she tends to get the most fruit already. However, not wanting to miss a morsel, when she has finished hers, Sally will move along the barrier knocking other elephants out the way like dominoes to get to the last of the buckets. Unfortunately, being as close as she is to her “Aunty”, Thandi has also picked up some of Sally’s bad table manners. For the more timid elephants of the herd this was quite off-putting and they were not always coming to the barrier. Therefore, the decision was made to extend the barriers and, in December, three of them were made longer. Since the extensions we have found that it is much more likely to have all ten elephants at the barriers. This means that the shyer members of the herd like Shungu, Keisha and Madiwa can now enjoy the fruity treats too, which is lovely to see! 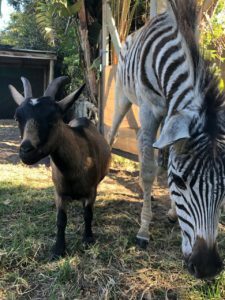 Last edition we told you about our orphaned baby zebra, Mala, and Bokkie, her pygmy goat companion. We are pleased to announce that our cheeky, striped baby is growing up to be a strong, independent zebra and we are all so proud of how well she is doing after her unfortunate start in life. Since last time, Mala has had a new day-time enclosure built for her and Bokkie which gives her more room to gallivant and graze. The wire fencing means that the other zebras from the park can come by and visit (which they do daily) whilst keeping Mala free from harm. As Mala is doing so well we are now looking into moving her on from the park. Unfortunately, due to Mala having been brought up by humans it would not be appropriate to try and re-integrate her into the herd here. The place we have in mind will mean she will live as wild as possible with plenty of other zebras. We will be sad to see her move on but we know it is for the best. We will keep you updated! As many of you will be aware, we have two night camps here at the park. These allow for the elephants to be able to continue to graze at night and get some rest whilst in the safety of a fenced area. The elephants are divided into these camps depending on their relationships with the other herd members. When they first arrived Amari, Shanti and Madiwa had their own night camp to allow for a bit of time to settle into their new surroundings. This left Sally, Thato, Keisha, Mashudu and Shungu to share the other camp. Thandi and Nandi should have been in the main camp with Sally but as a result of Thandi being quite food-competitive during the night with the younger, less dominant elephants in the herd, it meant that she and Nandi were penned over-night. These pens ensured all elephants felt more comfortable and were able to eat and sleep in peace. Nandi was penned to keep Thandi from becoming lonely or anxious during the night and showed little, if any, signs of being affected by this, so long as she had her daughter beside her. However, this was never a long-term solution so as soon as the opportunity arose the attempts at releasing Thandi and Nandi from the pens started. 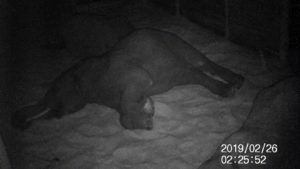 Elephant relationships and the dynamics within the herd can be hard to second guess and getting the night-time arrangements right can take some time. On our initial attempt, as the new girls are now more comfortable at the park, it was decided that they could be joined by the two boys, Shungu and Mashudu – who, due to their lower hierarchal status, were more likely to be pestered by Thandi. At first, this seemed to work and the boys settled in to their new surroundings with Thandi and Nandi being able to move out from the pens and have access to the main camp with Sally, Keisha and Thato. Unfortunately though, after a couple of weeks this arrangement fell through as Mashudu was showing signs of not being comfortable in his new night camp and Thandi had begun giving Keisha some trouble. So, it was back to the drawing board! The next plan, and the one still in play at the moment, was to use the Orchard to house Sally, Nandi, Thandi and Thato at night and have the younger, less dominant group – including Keisha, in the main camp. During all of this time and through all the changes, AERU have continued to monitor the situation with regular evening, morning and all-nighter observations. We have been particularly interested in finding out where everyone was now sleeping, ensuring they were resting as much as they should be at night. A big thank you to Laura for trusting us with the camera and helping us with set ups to get some really cool footage! (Watch our video compilation here: https://www.facebook.com/AERUVolunteers/videos/540195730118448/). This has so far been a successful and positive change for all the elephants and everyone seems to be adapting well to the changes. AERU will continue to monitor both camps to ensure all elephants stay comfortable at night. 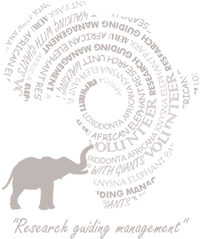 We are very excited to announce our new one week “EVERYTHING ELEPHANT” volunteer experience! Our Everything Elephant Programme is a specially tailored experience for people who cannot join us for 3 weeks or longer. 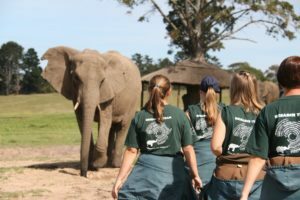 It is an intense week that allows volunteers to immerse themselves in everything elephant with a week of learning, observing and walking with our pachyderm family. This programme will be run every three weeks, and days will be jam-packed with educational talks, presentations and of course, lots of time with our herd of gentle giants! 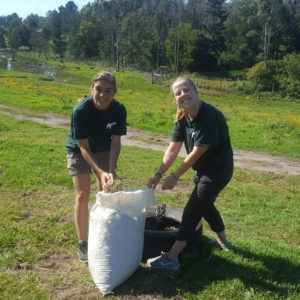 Volunteers will learn how to identify the ellies, assist with data collection and collection of dung samples, and create enrichments for the elephants…and so much more! 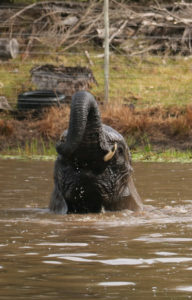 With the warm weather we have had this summer has come the chance for us to witness some glorious moments of elephants swimming in the dam. Madiwa and Mashudu love to play in the water – sometimes staying in the water for a long time, even if they are by themselves! 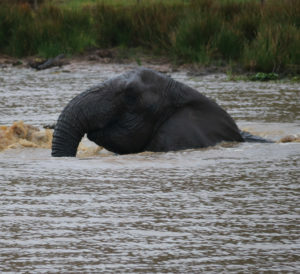 It is always interesting to us to see elephants playing together in the water. This is especially so for those who would not really spend time together on the field. It’s as if the water is some kind of safe space without the normal societal rules. 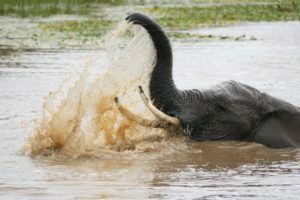 Watching elephants playing in the water is a magical sight and we thought we would share some of our best-captured moments with you. We would like to dedicate this newsletter in loving memory of Timothy Paul Gardner, a volunteer who stayed with us for a month in February 2015. Upon his passing in 2016 we received several donations in his honour from friends back in the UK. At the beginning of March this year his wife, Jay Turner-Gardner kindly donated over R9000 which was left to AERU by Tim in his will. Jay and friends we thank you from the bottom of our hearts for your generosity, we are truly touched that Tim’s time here was so special for him.